View of St Kenelms Chapel stands on Clent Hills near Halesowen in Shropshire. According to legend a spring behind the chapel flows from the spot where King Kenelm of Mercia was killed in the 9th century. The spring was believed to have healing properties and became a place of pilgrimage. 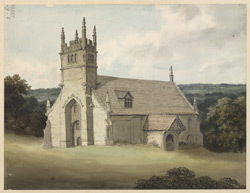 St Kenelm’s Chapel was built as a Chapel of Ease for the nearby Halesowen Church and in the late 19th century became Romsley Parish Church.